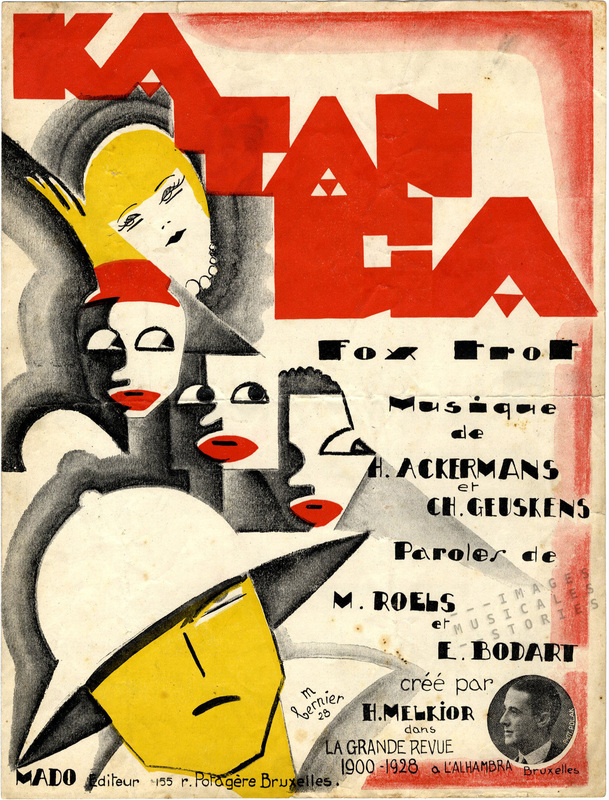 ‘Katanga’ by Hippolyte Ackermans & Charles Geuskens, lyrics by M. Roels, published by Mado Editeur (Bruxelles, 1928), illustrated by Alfred Mariano Bernier. 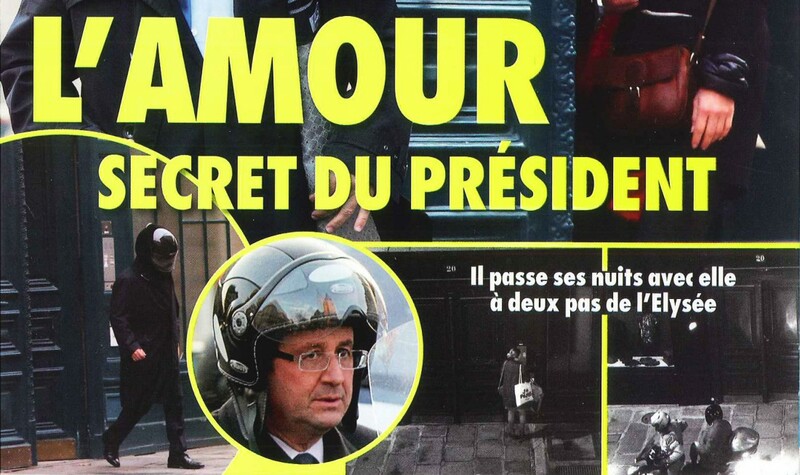 Voici le style moderne: the Katanga Fox Trot! 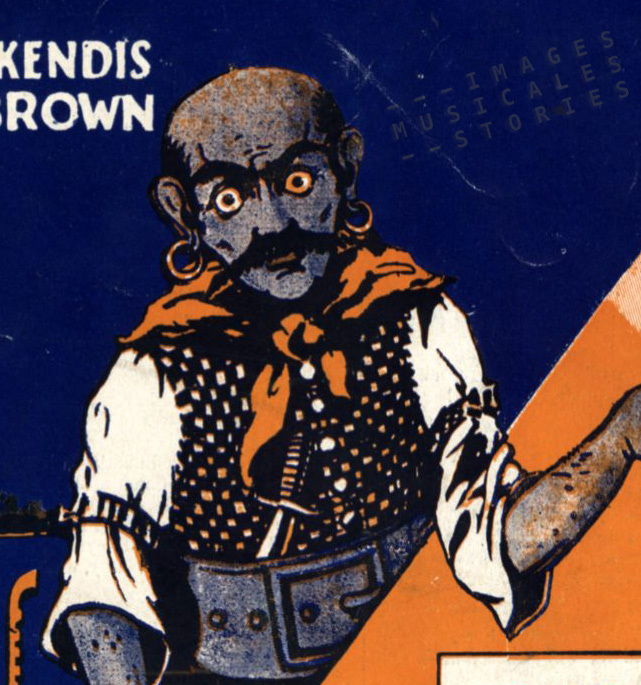 The forthright and powerful cover made by Alfred Bernier has the typical Art Deco marks. A purified theme, rendered with honest lines and shapes. The natural forms are geometrically stylised, they become streamlined. Repeated elements create a rhythmic tableau of colours, shapes and letters for the song about a man longing both for the faraway land and the woman who lives there. We know next to nothing about Bernier. Having studied at the Académie de Bruxelles, he was active as an illustrator for Belgian music publishers during the end of the Twenties. 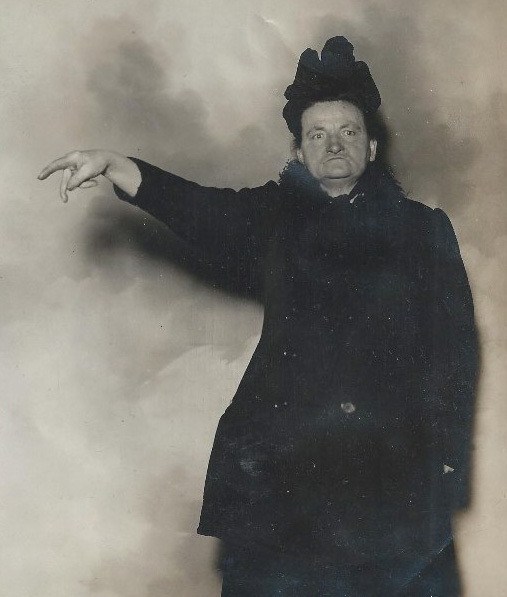 He was born near Buenos Aires in 1888. We have two other covers in our collection, one of which is the black and white ‘Volga!’. This is thousand miles away from Katanga, but also a delicious Art Deco cover. The stark composition expresses the strength of the workmen and the violent wind. Again, repeated elements create a dynamic scene, frozen in time. 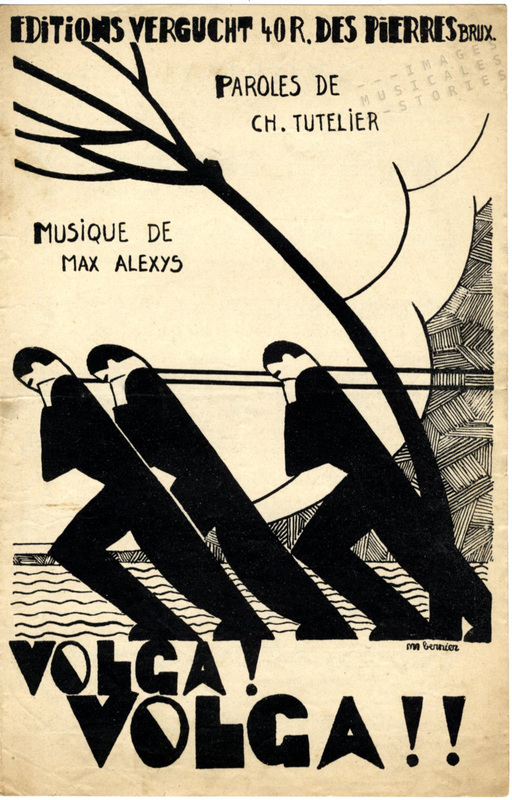 ‘Volga!’ by Max Alexis and Charles Tutelier, published by Vergucht (Bruxelles, 1929) and illustrated by Alfred Mariano Bernier. 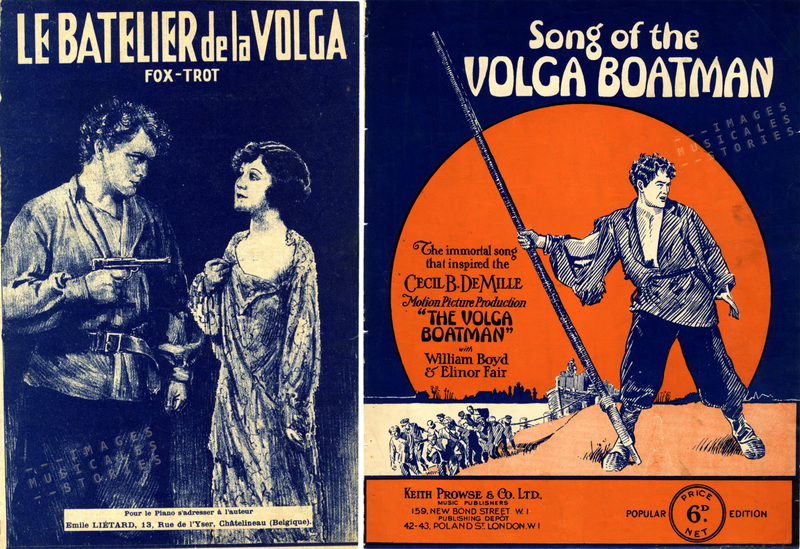 The song by Charles Tutelier was probably inspired by the 1926 epic silent movie of Cecil B. DeMille, The Volga Boatman. This big-scaled romantic melodrama, set in the 1917 Russian Revolution, was a shift from the usual anti-Bolshevik films, in that it also focussed on the oppression and the cruelty of the Czar’s regime and did not portray all the revolutionaries as just dumb and violent agitators. On the contrary, our hero is even susceptible to romantic entanglement. 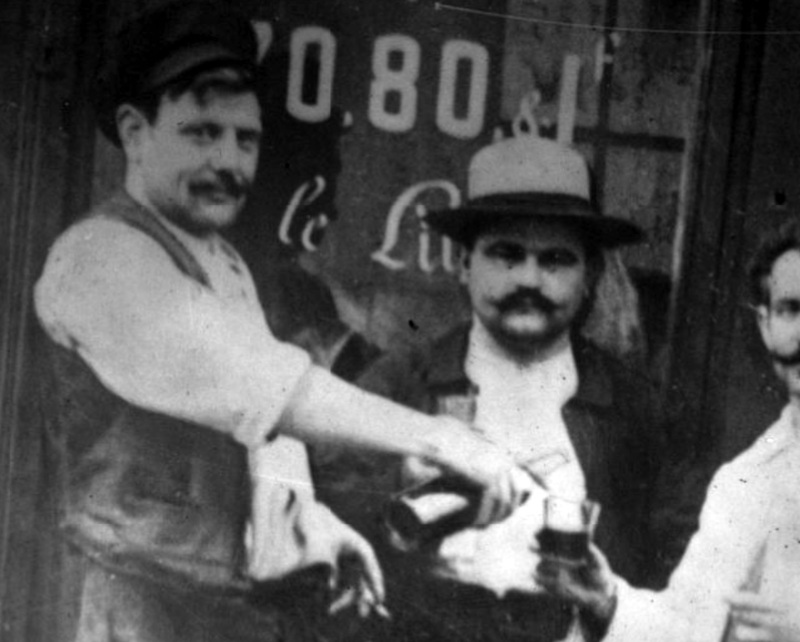 See for yourself in this short montage we made from the 2-hour classic of the silent screen. The film gets an unintentional Dadaistic twist when the social order is being ‘revolutionised’ by the Reds. 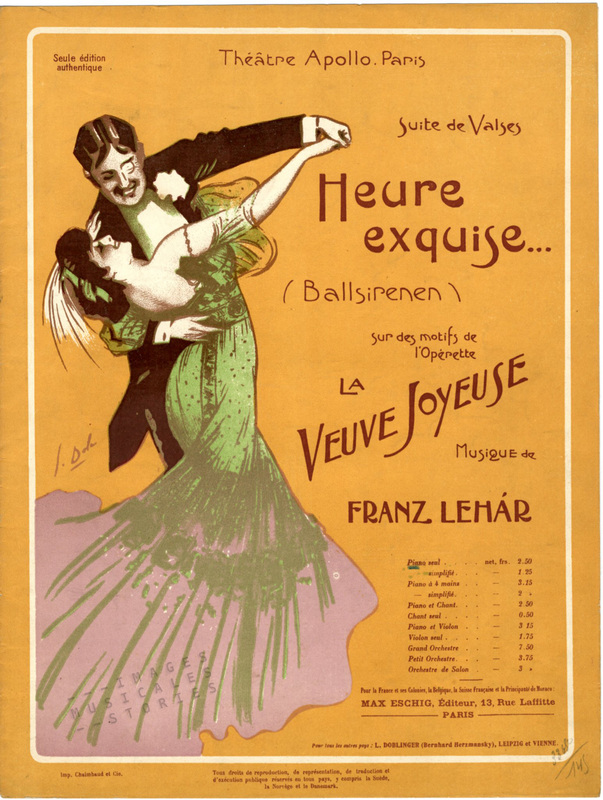 The film was an international success and generated sheet music covers in many countries. 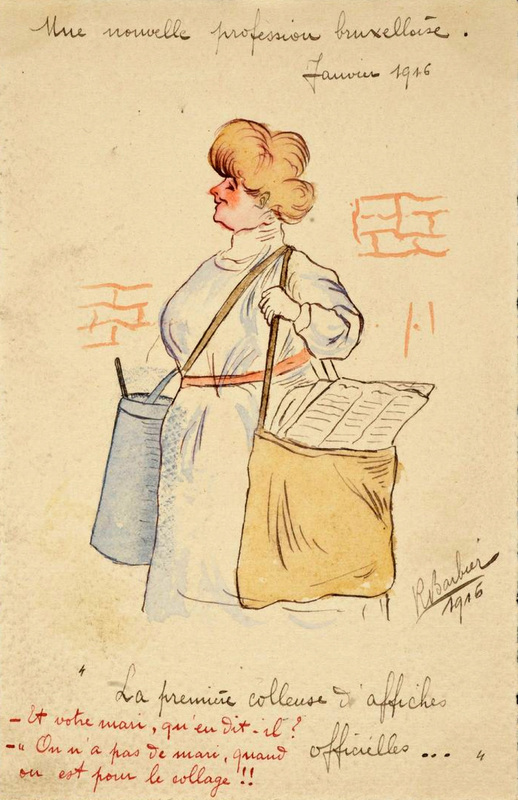 Left: ‘Le Batelier de la Volga’ by Emile Liétard (Châtelineau, s.d.). Right: ‘Song of the Volga Boatman’ published by Keith, Prowse & Co (London, s.d.). Both unknown illustrator. Left: ‘Wolga Lied’ published by B. J. Smit & Co (Amsterdam, s.d.) 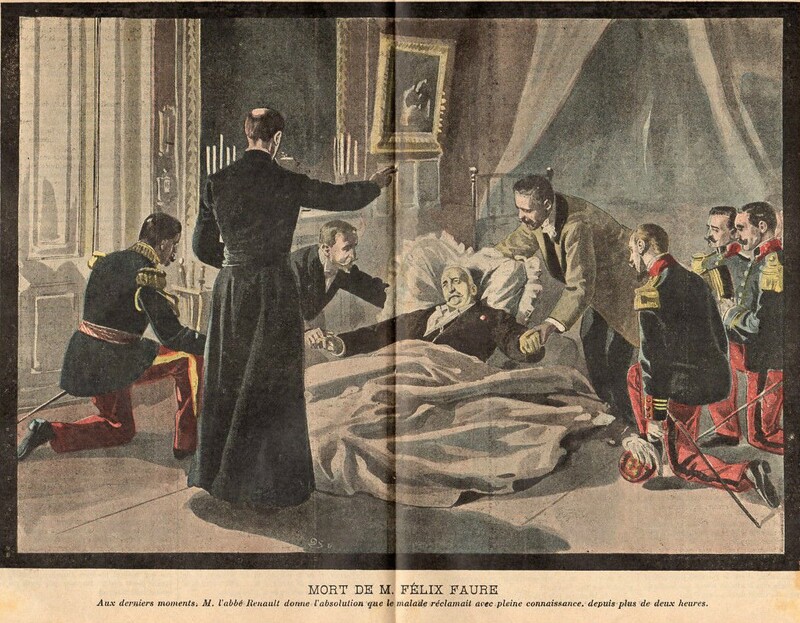 illustration signed F.K. 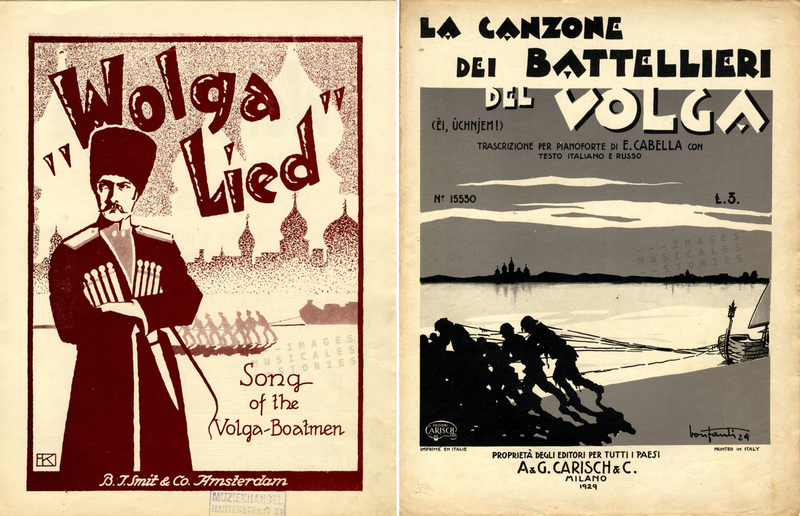 Right: ‘La Canzone dei Batellieri del Volga’, published by A. & G. Carisch & C. (Milano, 1929), illustrated by Bonfanti. One can wonder why in 1917 the title character had to work as a boatman on the Volga. For at least a few decades there hadn’t been any boatmen (Burlaks or barge haulers) working on the Volga. 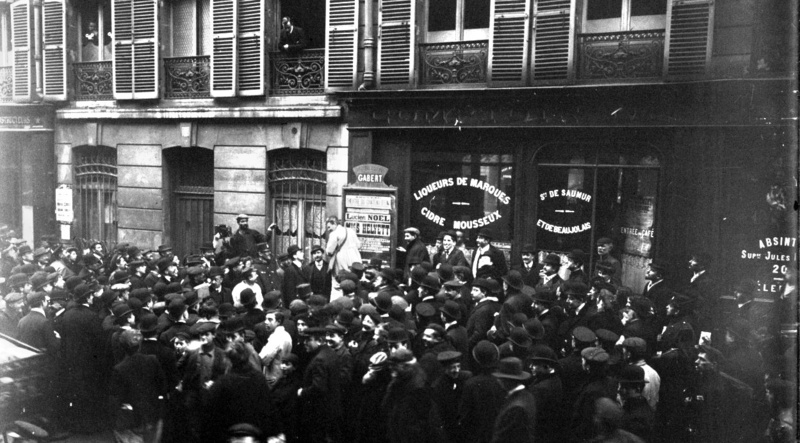 Cecil B. DeMille called this tampering with ‘details’ from the past, telescoping history. His reason was probably very Hollywoodesque: if the American audience knew one Russian song, then it undoubtedly was The Song of the Volga Boatman. Let’s take a minute to hear and see a poignant and primal rendition of the song by the Bulgarian bass Boris Christoff. 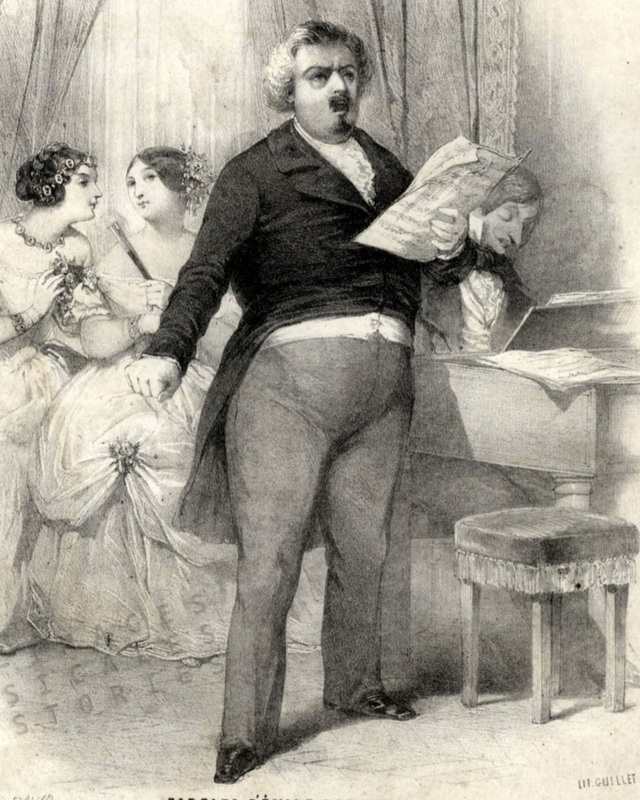 The firm stance of Christoff calls to my mind the posture of the gentleman singer drawn by Jules David for the song ‘Ténors et Basses’. In 1873 Ilya Repin finished his iconic (almost 3m wide!) 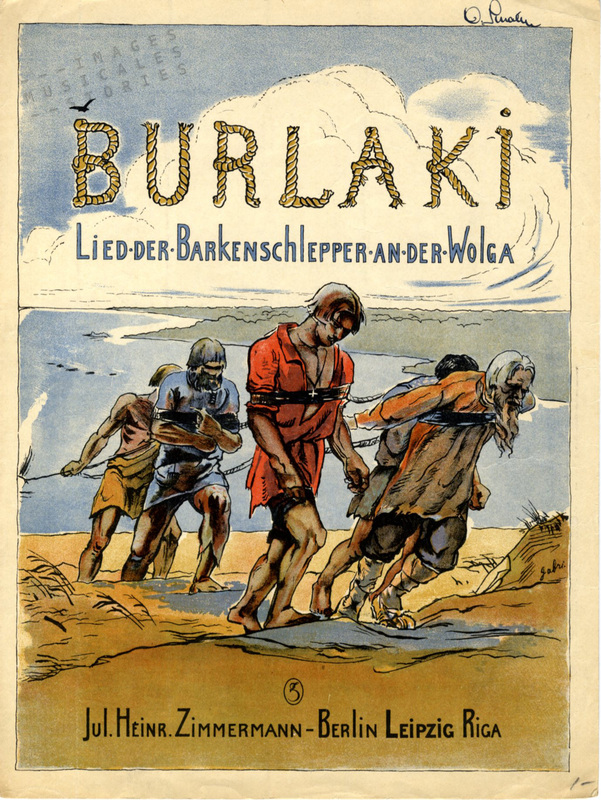 painting of burlaks along the longest river of Europe, in Tsarist Russia. It both condemns inhumane and harsh working conditions, while also saluting the dignity and long-suffering of the exhausted working class. 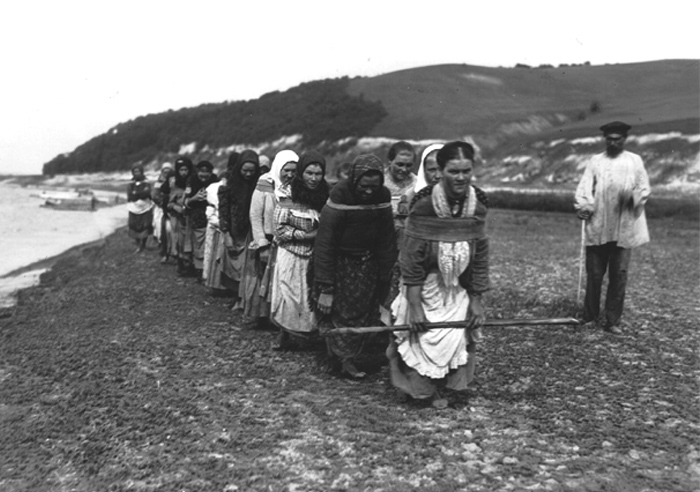 It was not only in Russia that ships were pulled by manpower along a tow path. Wherever it was impractical to sail, human force was used to drag the vessels. 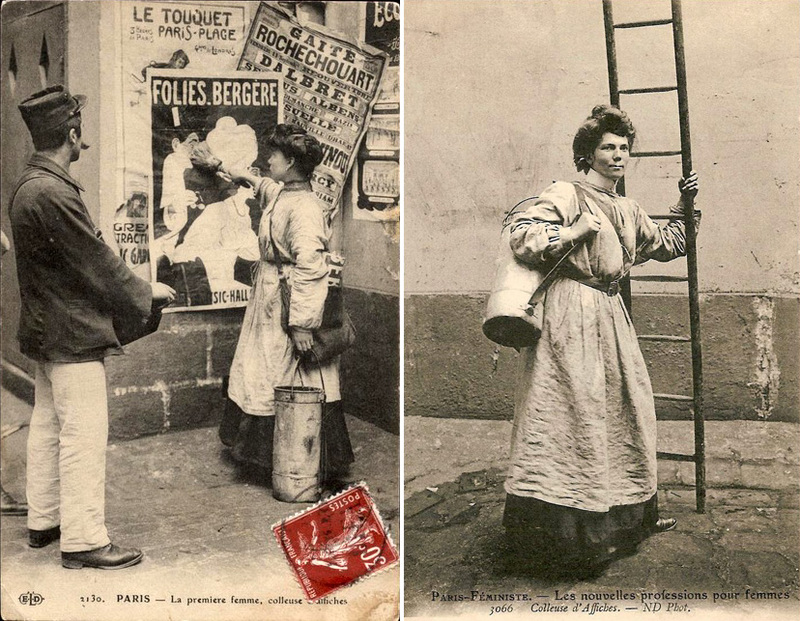 In the second half of the 19th century it apparently was a favourite theme for painters. 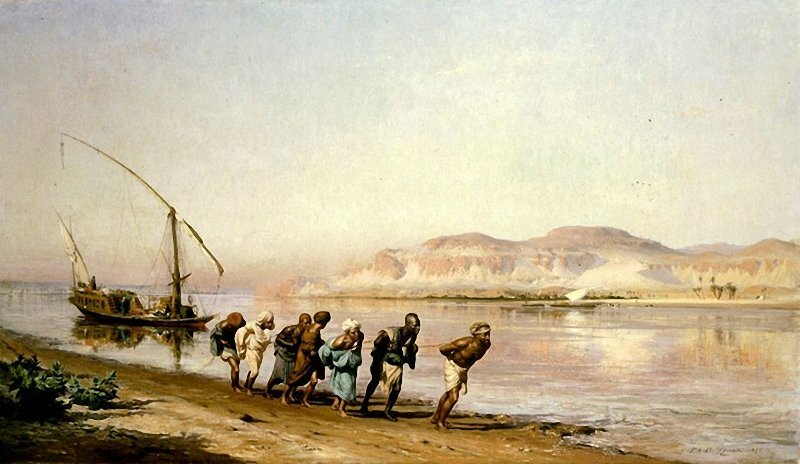 Frederick Arthur Bridgman: ‘Towing on the Nile’, 1875. 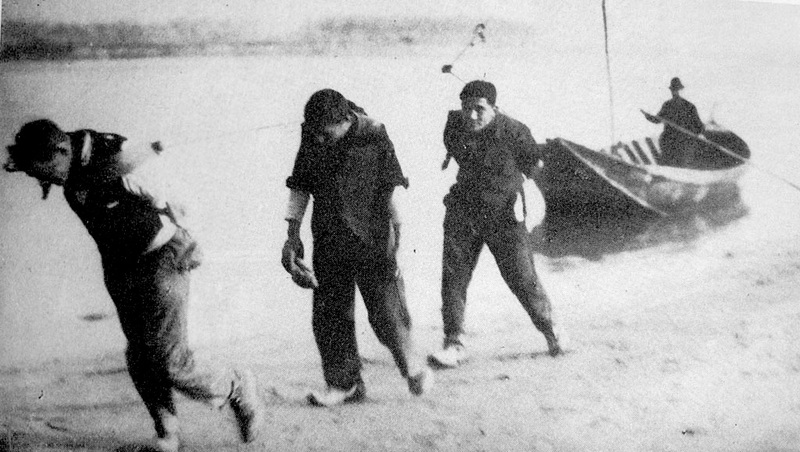 We found unsettling photographs of this human labour. 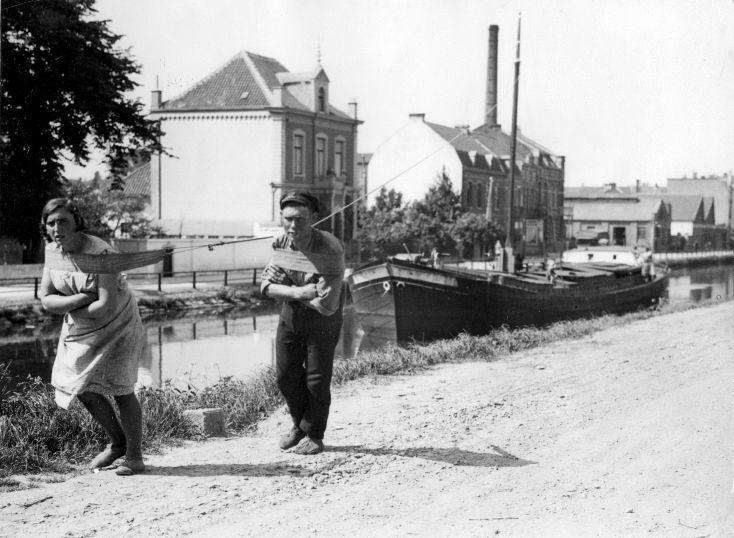 On the towpath along the river Po, around 1920-1930. (source: G. Giarelli, La cultura del fiume: i barcari del Po, 1986/1987). Man and woman towing a cargo-boat through a ship-canal. The Netherlands, 1931 (source: Nationaal Archief). Later vehicles and beasts of burden replaced the human pullers, before the work became obsolete when ships were fitted with engines. 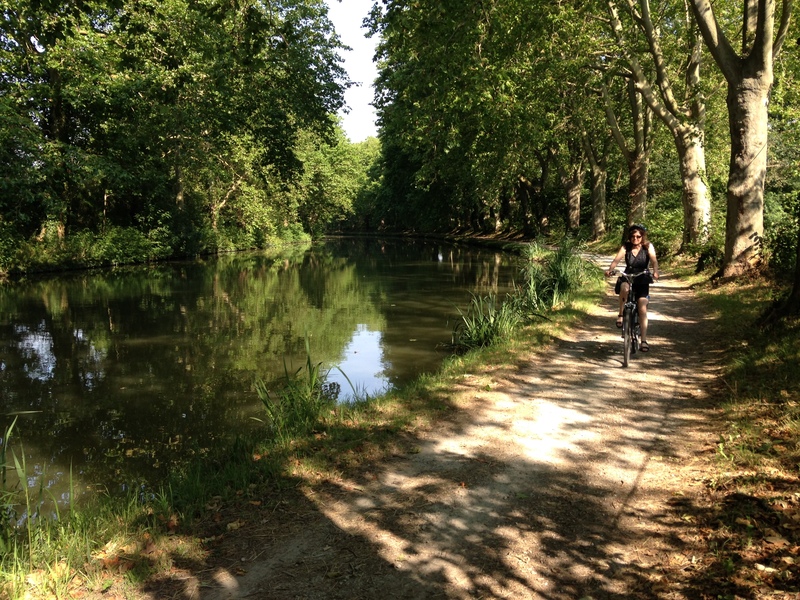 Towing paths now offer pleasant walks and tourist rides. ‘Yes! We have no Bananas’ by Frank Silver and Irving Cohn, published by Salabert, Paris in 1923 and illustrated by Roger de Valerio. A newspaper article on the threat of a banana shortage brings to mind the song Yes! We have no Bananas. 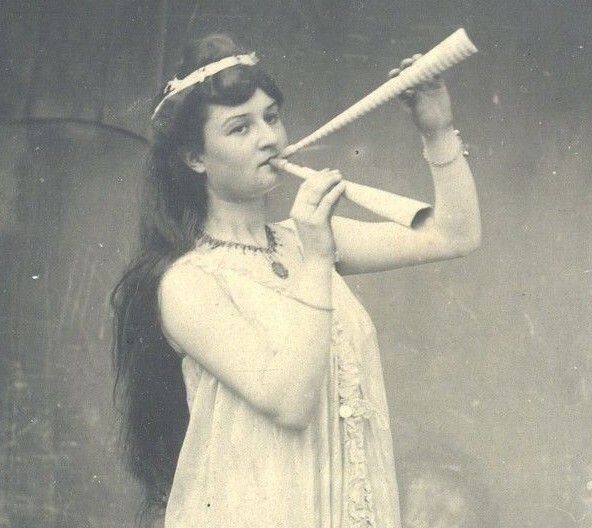 The origin of the song is not clear. Allegedly it was inspired by a shortage brought on by the Panama disease, a soil-based fungus which attacks the roots of the plant. As the banana is a monoculture crop, this means that if something goes wrong, the whole crop can be lost. The earlier and more tastier banana variety Gros Michel (or Big Mike) was thus completely wiped out in the 1960s. Today the Gros Michel is replaced by the Cavendish, but it is still a monoculture and it is no longer resistant to a more virulent strain of the Panama disease. About 10 years ago this new strain started to destroy plantations in Asia and Australia, threatening the Cavendish banana with the same fate as its predecessor. 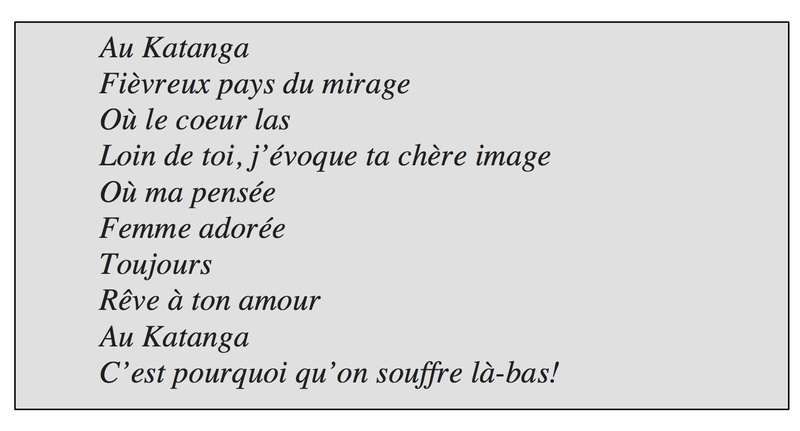 Roger de Valerio, an illustrator with a vivid imagination, apparently didn’t read the original lyrics before illustrating the cover of the French version of Yes! We have no Bananas. 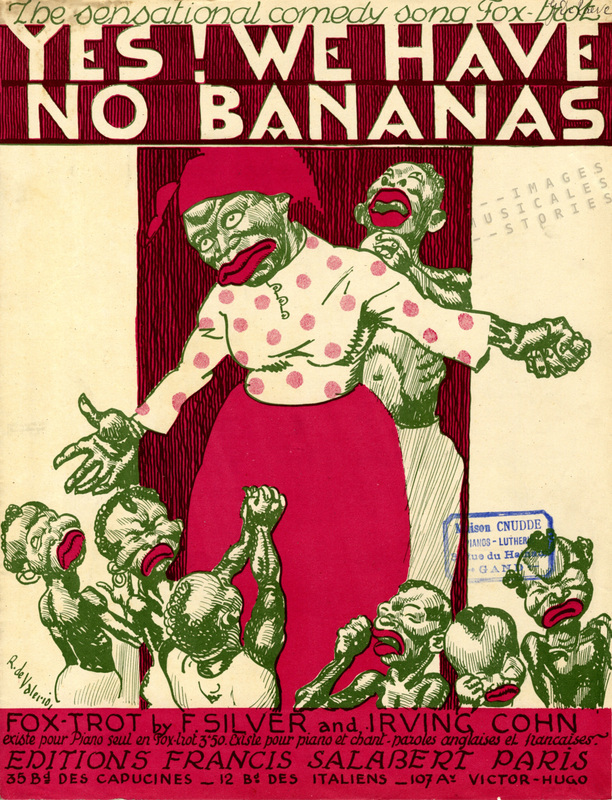 He simply associated bananas with the stereotype of the black mammy and black people. To my dismay, this old stupid cliché is sometimes voiced on our soccer fields. 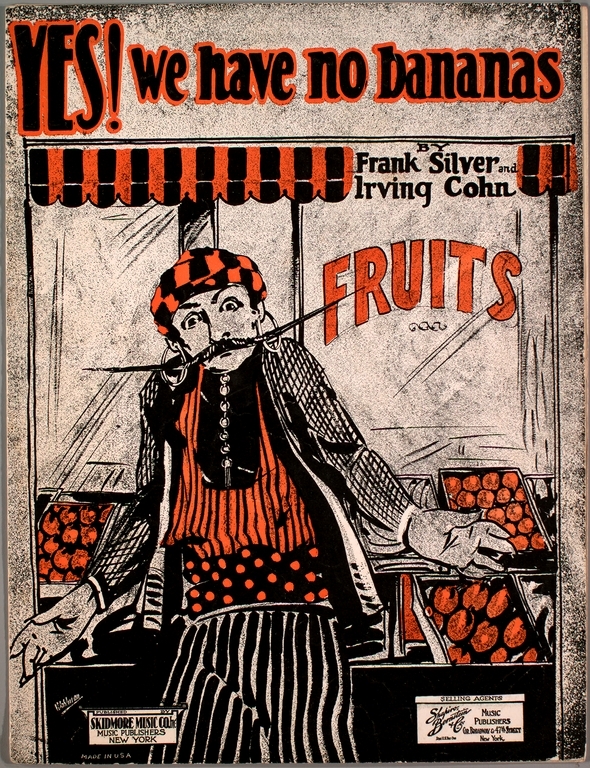 For the cover of the original American sheet music Sol Wohlman straightforwardly illustrated the story: a Greek American greengrocer who tells his customers, in broken English, that he has no bananas to sell. 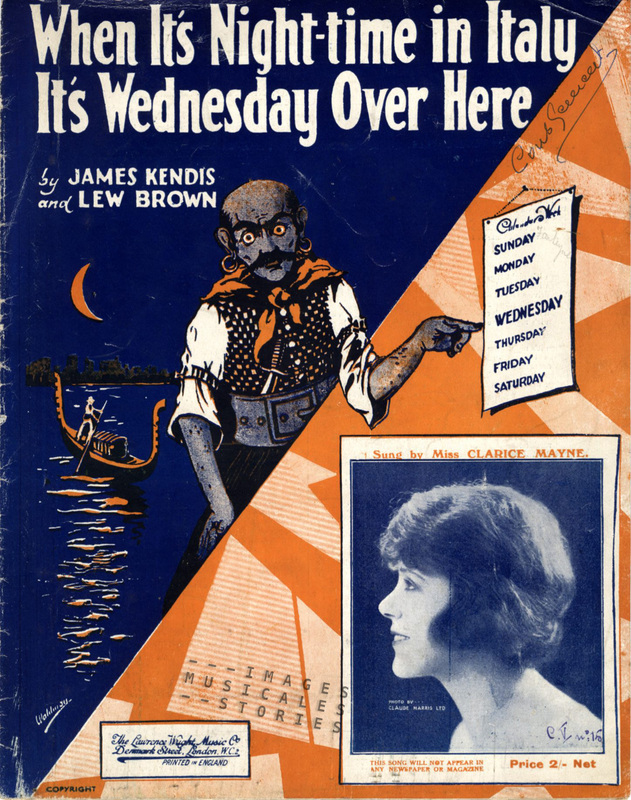 Wohlman himself falls into the trap of stereotyping when, for another sheet music cover, he caricatures a typical Italian person. Notice the similar exotic mustachios, earrings and mischievous eyes. Caricature of an Italian man drawn by Sol Wohlman for the cover of ‘When it’s Night-time in Italy It’s Wednesday Over Here’ published by The Lawrence Wright Music C°, Leicester, 1923. Back to our song. After Eddie Cantor used the novelty song in one of his Broadway revues in 1922, it topped the charts in America and became a smashing success all over the world. 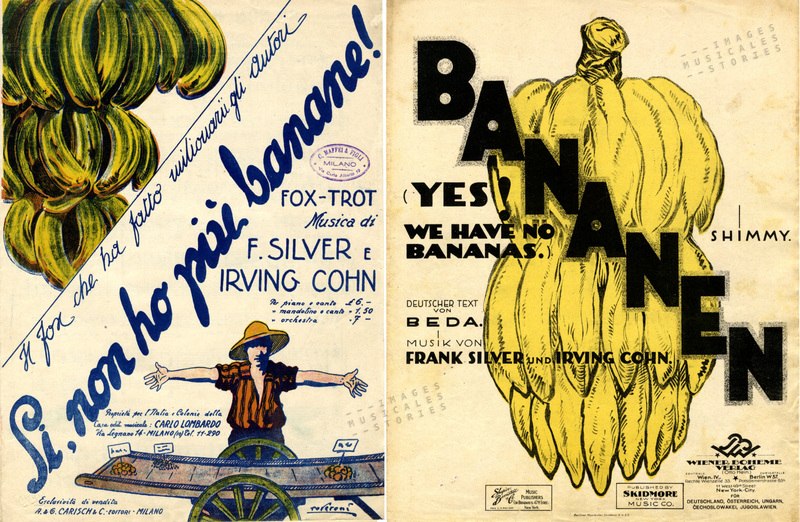 Left: ‘Si, non ho piu banane!’ by Frank Silver and Irving Kohn, published by Carlo Lombardo, Milano (s.d.) and illustrated by Roveroni. Right: ‘Bananen’, by Frank Silver and Irving Kohn, and translated by Fritz Löhner (Beda), published by Wiener Bohème – Verlag, Vienna in 1923. The song inspired a follow-up song “I’ve Got the Yes! 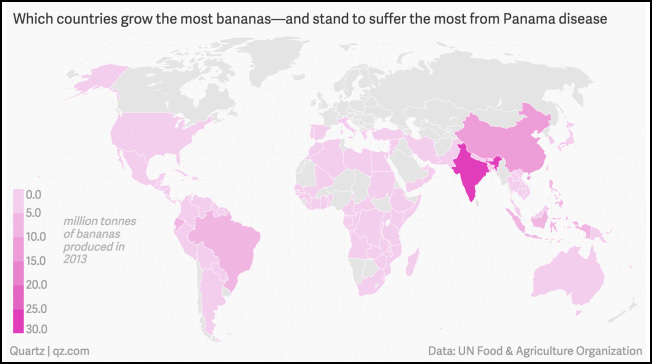 We Have No Bananas Blues”. Left: ‘I’ve Got the Yes! 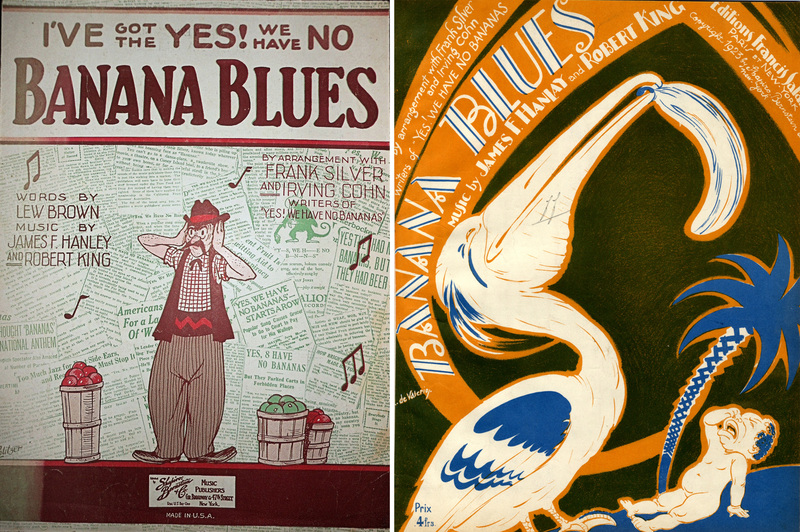 We Have No Bananas Blues’ By Lew Brown, James Hanley & Robert King, published by Shapiro, Bernstein & C°, New York in 1923 and illustrated by Politzer. 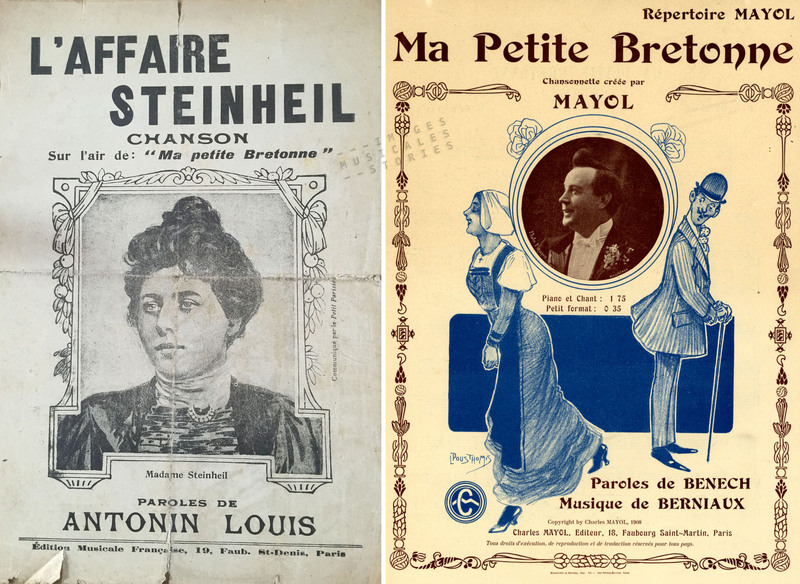 Right: The same song published by Salabert, Paris in 1923 and illustrated by Roger de Valerio. Again, Roger de Valerio gets the wrong end of the stick about the song’s content. 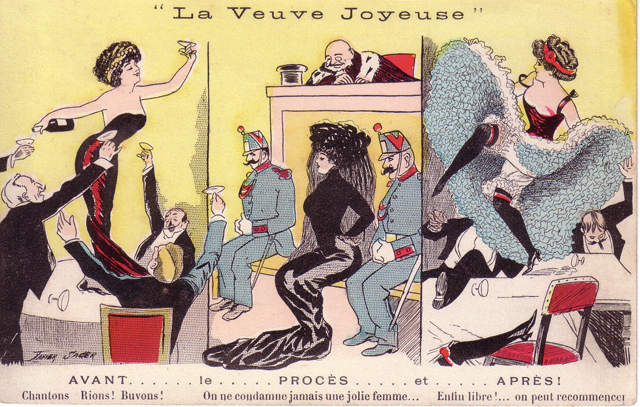 It is obviously a mockery about a man who cannot stand the earworm, nicely illustrated by Politzer. Although de Valerio is to me the better illustrator, he once more gets his inspiration from a black people stereotype, palm tree and all. 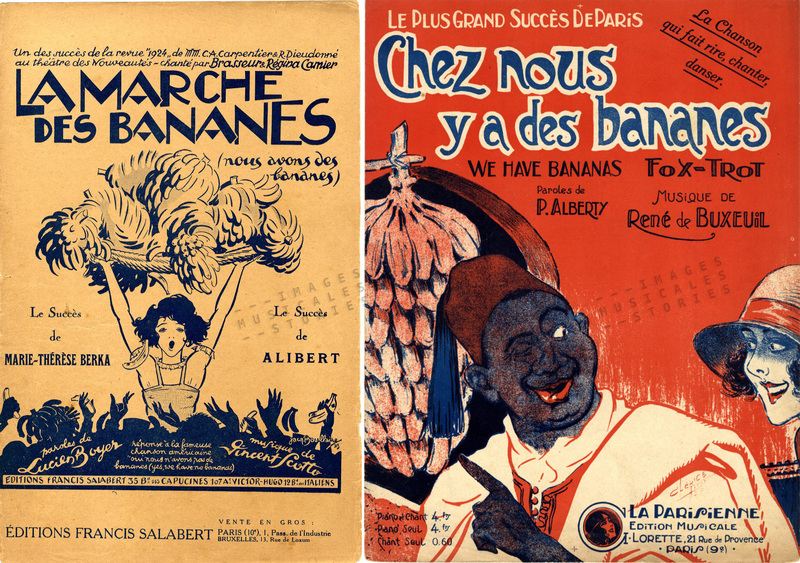 In France the song spawned spoof versions, emphasising that the chauvinistic French didn’t suffer a banana shortage: Chez nous y a des bananes (We have bananas!). For illustrator Clérice, selling bananas is not a Greek merchant business, but a job for shrewd African vendors. 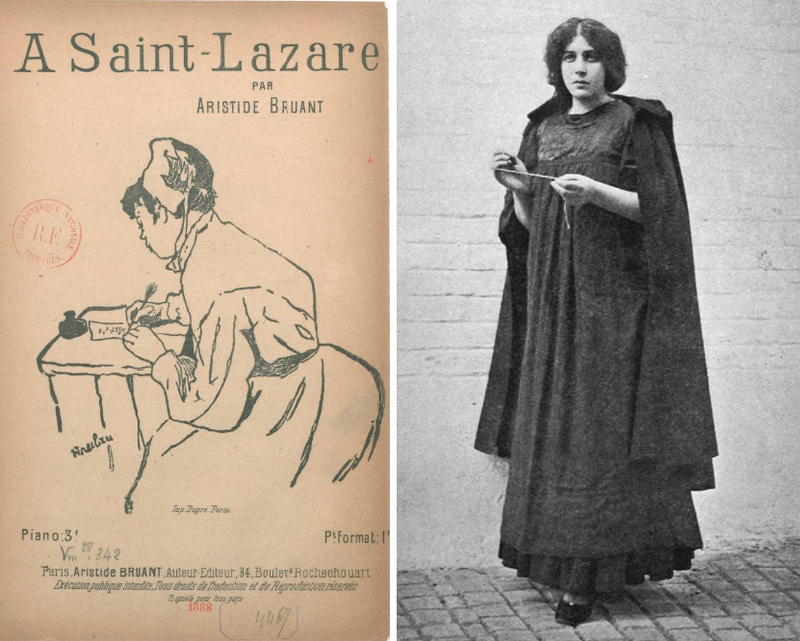 Left: ‘La Marche des Bananes’ by Vincent Scotto, published by Salabert, Paris in 1923 and illustrated by Jacques Boullaire. 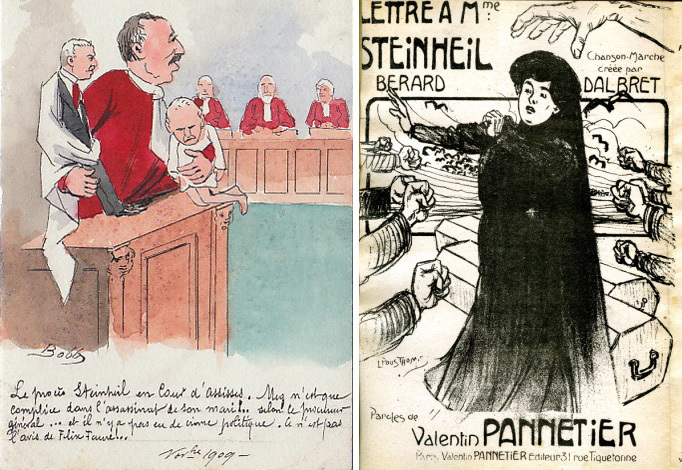 Right: ‘Chez nous y a des bananes’ by René de Buxeuil, published by La Parisienne, Paris in 1923 and illustrated by Clérice frères. 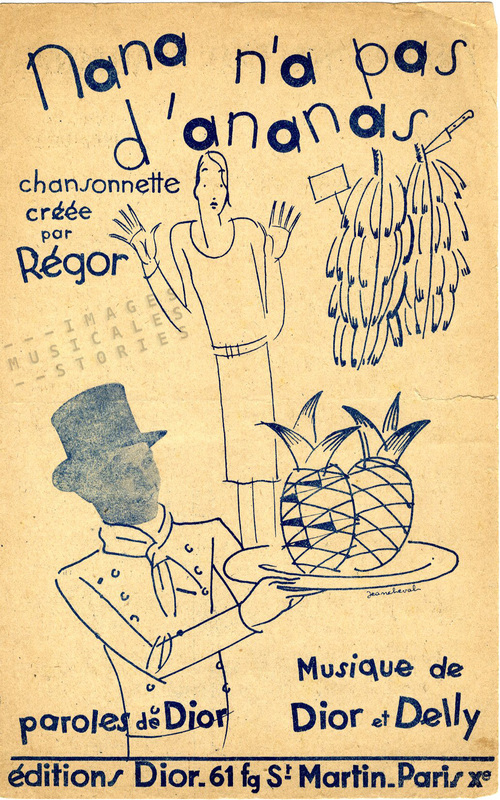 The great Maurice Chevalier performed another parody: We have pineapples! (Nous avons des ananas!). 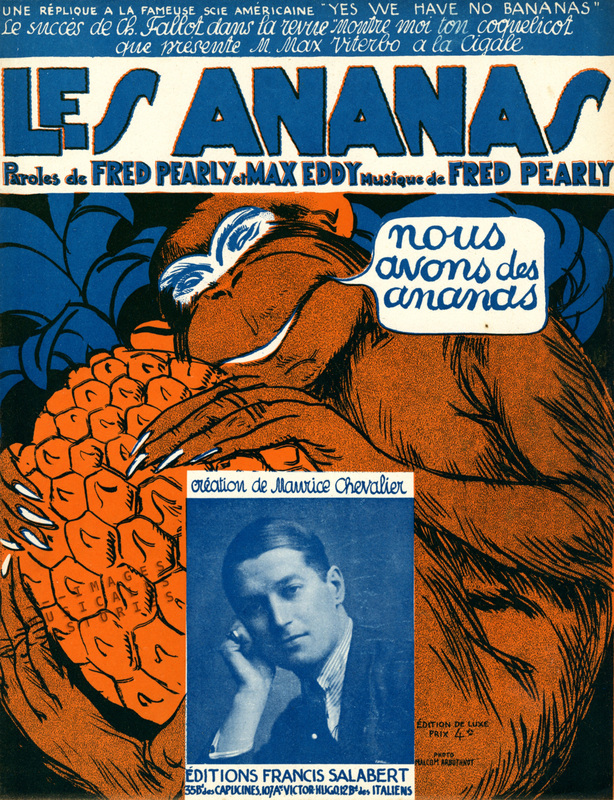 ‘Les Ananas’ by Fred Pearly & Max Eddy, published by Salabert, Paris in 1923 and probably illustrated by Roger de Valerio. This in turn was an inspiration for the silly song ‘Nana n’a pas d’ananas’ (Nana has no pineapples). 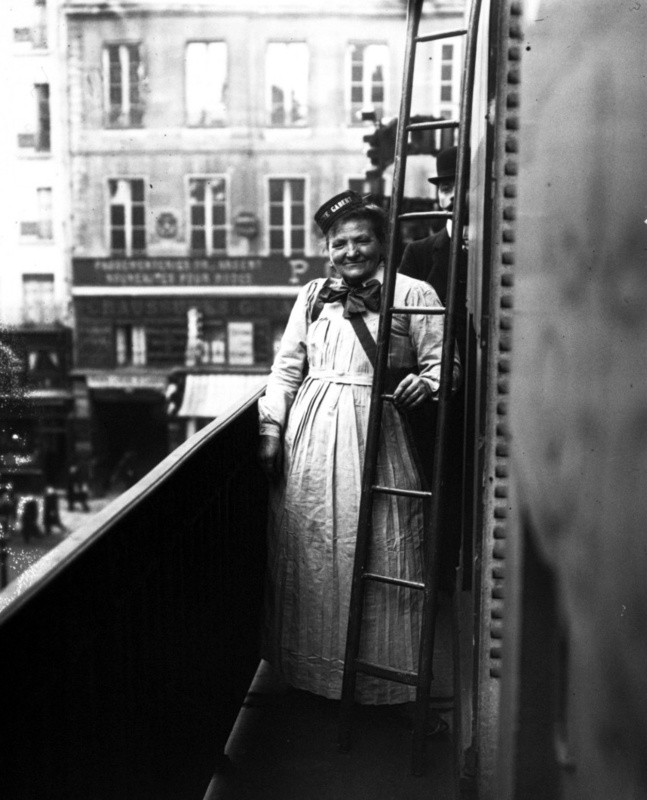 ‘Nana n’a pas d’ananas’ by Dior & Delly, published by Dior, Paris s.d. 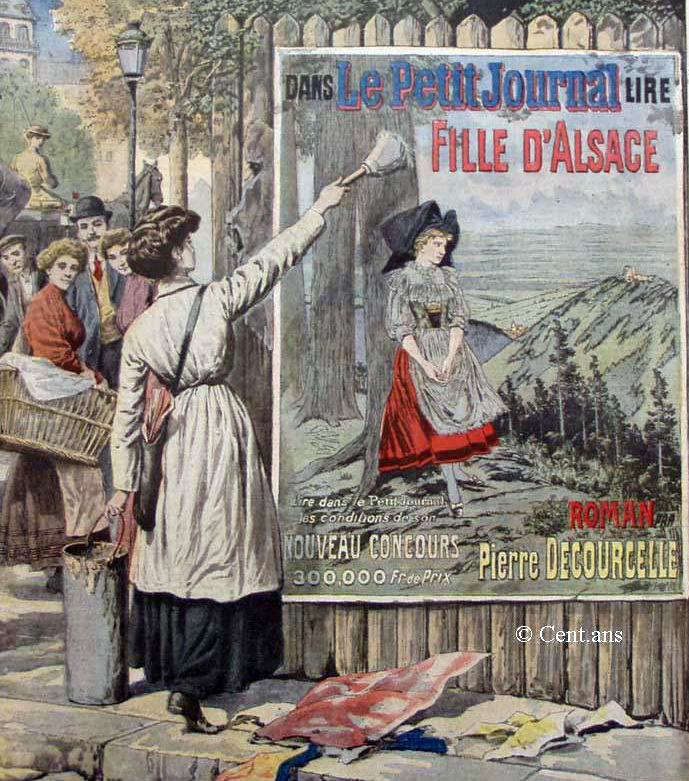 and illustrated by Jean Chevalier. Time to listen to the song. Mind you, it will stay with you for the whole day and slowly drive you mad as a box of frogs. I prefer the version by the Pied Pipers from the 1948 musical film ‘Luxury Liner’. And because I adore Billy Wilder, I include a German version of the song from the Cold War comedy ‘One, Two Three’. The film features James Cagney as Coca-Cola’s head of West Berlin operations trying to get Coca-Cola into the Russian market.